School teacher Fang Lan (Zhou Xun) lives in Hong Kong during the Japanese occupation, and soon finds herself drawn into the underground Chinese resistance. As her war-time exploits grow and expand, it begins to affect the lives of those around her: friends, family, and particularly her doting but fearful mother (Deanie Ip). Two years ago, the veteran Hong Kong filmmaker Ann Hui scored a career high point with Our Time Will Come, a war movie that emphasises the personal over the political and which works from an intimate starting point to tell a particularly emotive and spirited drama. 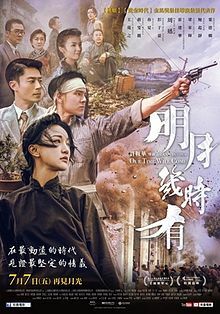 It is a great war film, but it is great because it transcends the genre and becomes a film not about action or violence but of individual people: how they are changed by the war, emotionally cope with the strain, and keep their hopes up against a backdrop of Japanese brutality. Zhou Xun delivers exceptional work as Fang Lan, richly portraying the character’s development and growing maturity as she shifts from passive support, to nervous errand-running, and all the way to gun-toting, murderous rebellion. There is a complexity written into the character, and Zhou works with the various facets of Fang’s personality to create someone more ambivalent and uncertain than a simple war movie heroine. She performs well against Eddie Peng, who plays a local rebel leader nicknamed “Blackie”. There is romance to be found here that is rather heartwarming, but it is also balanced by the bleak reality of Japanese military rule. Deanie Ip is enormously effective as Fang’s mother, whose first concerns are entirely for her daughter’s safety but who gradually becomes as dedicated a supporter of the resistance itself as Fang is. Her nervous, jittery manner contrasts sharply with active resistance fighters, but over time she is revealed as a hugely sympathetic presence in the story. Ip’s performances have undergone a tremendous renaissance in recent years, thanks her roles here and in Ann Hui’s other recent drama A Simple Life. Other key actors to make an impact here include Wallace Huo as a secret agent masquerading as a Japanese military aide, and Masatoshi Nagase as a poetry-loving Japanese commander. The individual events throughout the film do not necessary stand out, but the personalities of the characters certainly do. The film is framed by interviews by Hui with a elderly man who recounts his life during the war-time period. At first it suggests a documentary-drama blend, until you recognise the old veteran is a younger man in make-up; Tony Leung Ka-fai making an uncredited appearance to give the film an additional element of realism. The 1940s action is far more stylised and considered that the present-day frame, and benefits from Yu Lik-wai’s strong cinematography and Man Lim-chung’s beautifully developed production design. Our Time Will Come is an original and distinctive war film with a focus on ordinary citizens taking matters into their own hands. It is a a patriotic film almost to the point of propagandism, but it is also packed with sincerity and dignity. Emotionally it feels genuine and authentic. This is one of Hong Kong’s very best films from recent years. Sounds like my type of film. I will look out for it. Good review.